about whatever the Lord wishes to do to him. he ever holds a longing, who strives out upon the streams. If you sat through Brit Lit in high school, you probably read one or more of the Old English "elegiac" poems like The Seafarer, and had to write an essay on the contrast between sea-faring life and life ashore (with bonus points if you could articulate how this is extended to life on Earth vs. in heaven). And if you've ever come inside from a miserable, cold, raw day outside, you have an idea of what the poet is going on about. It's another level closer to go from a cold, raw outside to a warm inside that's filled with people, laughter, good food and drink. And which happens to look not unlike you might imagine a Saxon lord's hall to look. To experience that was a 'magic moment' for me. On this Veteran's Day (Observed), I feel compelled to note that a few moments or even hours outside compare in no way to the old seafarer, on his ship for days or weeks, or the modern warfighter, deployed for months. I'm not claiming that experience. It was just a step up from my previous experience. The cabins are unheated shelters. I have used tents both times I've gone, because... if I'm going to sleep in the cold, I'd rather have privacy! Faolan's headlamp looked mighty useful. A tall pole from which to hang the lantern would have helped. A small, light LED light with a hook (to hang inside the tent) would also be welcome. I used my 4" mat, the ExPed MegaMat. I didn't use the wool pad that I use when I dress it with sheets and blankets - the mat is insulating, and the pad is mostly to promote circulation. With a sleeping bag, the bottom layer allowed air to circulate between me and the mat. The first night, it was supposed to get down to 35 F or thereabouts. I slept in wool socks, bike shorts, sweat pants, a T-shirt, and an overshirt (which regrettably only had 3/4 length sleeves). I crawled entirely into the bag (which also kept the lights from the hall out of my face) with my CPAP hose as a snorkel. I woke up early in the dark of the morning because I was too hot. I removed the outer shirt and sweat pants and unzipped the side of the bag. Ah, perfect. The second night, temperatures were to fall to the low 20s. I downgraded the sweats to thinner exercise pants, but otherwise burrowed in the same. From the waist-down and ankles-up, I was fine. Despite shoving some clothes into the bottom of the bag, my feet were chilly (but not so cold I couldn't sleep). The drafts coming in from the top of the bag, though - those made my bare lower arms uncomfortably cool. I alternately tried to pull other blankets into the opening to plug it up, or toss them over the opening to cover it. At one point, I used a light piece of wool as a sort of wrap in the bag. These techniques worked well enough, and I slept okay. Definitely did not unzip the bag! I brought the wool pad, my plaid wool blanket, the furry blanket, and the aforementioned light wool wrap. I ended up only really needing the wrap, although the furry blanket was nice to snuggle with in the hall. Also, I used it as a cloak going from the hall to my tent, and WOW I felt no cold except through the soles of my turnshoes. That fake fur is super warm! I am now confident enough in the sleeping bag's capabilities that, next time, I may bring it as the back-up and try to sleep under blankets. I was only in garb for a few hours Friday night, so I just wore the same outfit again on Saturday. I didn't need the other outfit I had brought, BUT. It would have been easy for me to have slipped in the mud or frosty leaves, dumped water on myself, or had some kind of mishap that would have left me dirty and/or wet and cold. So I think having the extra outfit was a good idea. I left it as a cap with long tails. I have another scarf I can use to make it more hood-like - I will experiment with pinning things together and see how it looks. Another nice thing about Red Mountain is that it gives me an opportunity to wear warm garb like this! Always a bit touchy, feeling out a group's unspoken policy on bardic performance. Friday night, the vibe was "let's sit around the fire and talk." Saturday, after the feasting was done but before the plate-clearing had happened, a lady got up to sing. Faolan and I looked at each other when she was done - was it an open floor? Or were we still in "feast" territory, where you don't generally want to put too many performances right after one another? Within a few moments, an Isenfiri gentleman got up to tell a story, and then he formally opened the floor to performance. Faolan and I each did one piece until we saw others taking seconds. I did the first five minutes of Brynhild's Tale (from disobeying Odin to Sigurth leaves her hall). On an inspired whim, I changed the opening sentence, much to the better. I had been doing "Brynhild was a valkyrie, handmaiden of Odin, chooser of the slain." It is now, "She stands before Odin, defiant." Much better hook - who is she? Why is she defiant? What's Odin going to do to her? Also has the benefit of cutting about 30 seconds of exposition. There was vocal disappointment when I cliffhangered. The second round of performances went much more quickly - not as many people took seconds - and someone asked if I intended to finish the tale that night, or if I would make them wait until next year. I did the rest of the thing, all 15 min or so of it, in a go. I paused at each break point to check that this was their wish, and it was. I made some efforts to be more effective with my gaze-catching and audience interaction, but I think I moved around too much. I need to work on being still, and moving only for effect, rather than having motion be a default. Pacing is distracting. It went over very well. I got more comments that I have in a while. 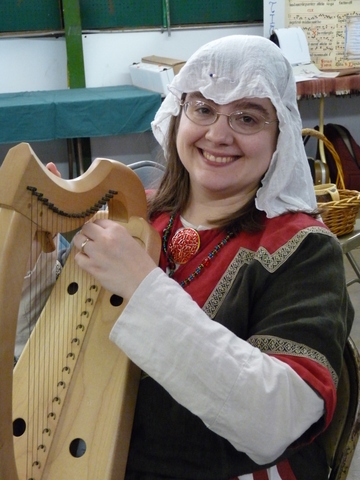 (Doubly gratifying - I'd opened with "Hild (The War That Does Not End)", which was the audience favorite at Pennsic. This time, they all liked the piece I'd actually worked on, so yay.) I think I will write them down elsewhere, so this post doesn't feel too self-congratulatory, but one thing is worth noting as a performance evaluation. One lady, as I finished the tale, looked... shocked? Displeased? Unsettled? I caught her eye, and she said, "That's it? That's how it ends? That is not okay!" She wasn't angry, I don't think, just sort of disbelieving. I think the problem is in part the nature of the tale, but my ending is also pretty abrupt and the closing words are not very strong. It needs some kind of closure, I think, for the audience. It could also be the 'problematic' nature of the piece. The third act violence is kicked off when Brynhild tells her husband that Sigurth slept with her by deceit, prior to their marriage. This is a lie. But her husband believes her. In August 2018, at Pennsic, this was just the typical sort of thing you see in a medieval story. In November 2018, after the Kavanaugh hearings, it's, ah, fraught. "Women are lying liars who shouldn't be believed!" is NOT supposed to be the moral of the story. If I had to assign an Aesop-like moral to it, it would be "Don't make promises you can't keep," or "Pursuit of honor is pursuit of death" or something more aligned with a critique of the morals of the warrior-culture that birthed the tale. My version ends with Brynhild stabbing herself, asking her maidens to die with her, telling her husband that she lied, and then pledging to be with Sigurth in the afterlife before dying. The "she was lying" thing gets dropped like a bomb just before the end, and that is probably not the best way to frame the end of the piece. I will have to work on it. Two events in two weeks! It's like some sort of record. This is a charming, laid-back event at a gorgeous 4-H camp in Isenfir. The main hall had a large fireplace and a really rustic log-cabin look to it - really felt like a mead-hall. I took classes on Birka posaments and sprang, did my "Beowulf" performance as requested, and enjoyed a quite delicious feast. I don't know if I've been to this local Lochmere event before. Since I've been rationing my events (e.g., since kids), a mostly-fencing event doesn't usually rise to the level of me spending one of my 'chits' on it. Having just spent a full Fri-Sun in Isenfir, I didn't think I'd be able to make this one. But the weather was lovely and my husband was okay with it, so off I went. Good Garb: I wore my oldest still-fitting violet tunic under my 7th cen. caftan, with appropriate jewelry and headgear. And you know what? I rocked it. More and more these days, I am looking in the mirror and seeing things that fit well and look right, instead of seeing a to-do list of things to improve. And at the event, a lady actually recognized what I was wearing down to the era, because she was interested in making the same sort of garb. Yay more Anglo-Saxons! Bardic: Lazy afternoon hanging with the bards. Got some tips from Lord Wyn that might help my strained throat. Warm up with humming, then open-mouth humming, then la-la-las. Keep throat relaxed when singing. I tried it and I think it helped. I told "Thrymskvitha" here and at Red Mead Hall, and it went really well both times. Comedy! Spinning: I entered my spinning into the Novice A&S competition, since I've been doing it just since last year's Sheep and Wool. And I won! Woot. I camped by myself this year, as an experiment. This took longer than I think it should have, partly because I'm still learning to set up the tent, but mostly because of the ridiculous heat and humidity. I had to take a lot of breaks. 5-6 hours to set everything up, 3-4 to tear it down. Tent was awesome, with plenty of room to store all my gear - even the folded-up EZ-Up I ended up not using. And really, almost ALL - the first time it rained, I dragged everything inside except the table and the 0g chair. We had reasonable rain - no crazy storms, but not just drizzle, either - and everything was dry. I did cut a tarp to fit as a ground cloth - so the brown one is the one to use from here on out. Stake tent corners, then up center pole, THEN stake sides. Oriental rug (4x6?) + double IKEA run (3x4) covered most of the floor. An old bathmat at the foot of the cot gave me a place to put the cast iron where I wouldn't have to worry about rust stains on the canvas. The 9x12 painter's tarp worked nicely for a day shade. (Note to self: Do not face front of tent towards the south.) I tied it to the tent and to some old poles, staked them down, and boom. A few days in, it seemed saggy, so I took a fourth pole, put a mess kit pot on it to soften the point, and used it to push up the roof a little. It would have helped if I could have run my guy lines out at wider angles, but that would've been in someone else's space. It seemed to keep things 'dry enough.' I wouldn't do calligraphy under it, or leave an important book out, but I could step out of my tent and make coffee without getting soaked, which was the goal. I used a large linen tablecloth at one point, clothespinned on, to help block out more sun. Digging through the matted roots in Pennsylvania clay with a hand trowel was hard. I got a blister (wear gloves!). But once through that, the clay was just powder I scraped and scraped until it was big enough. I didn't measure the hole, but I'd say 6" x 6" x 6-8" deep, maybe? It seemed to hold around a quart and met my wastewater needs. I have to sort of throw my hands in the air. I ate some of what I brought, but didn't touch a lot of it. I planned a lot of chicken stew - which it was too hot for me to want to eat. I ate a lot of cold salami and cheese, though. Bob's Red Mill mueseli with milk and fruit and hazelnuts made good breakfasts - and on the one morning that it was cold, I could heat it up on the stove. One gallon/day for washing seemed about right, but +1 gallon for every load of laundry. 4-6 bottles of water/day, I'd say. The trick is that when I'm out of camp, I'll drink what I bring with me (usually two bottles) but then I'll have to buy or cadge water until I'm back in camp. I had to buy Gatorade powder at the Cooper Store - I was really feeling the need for it, but hadn't brought any of my own. Making a fire with just me never quite seemed worth it, especially in the mornings. Last year's bread-making worked because I had committed to doing nothing all War. This year, I had morning commitments at 11am or earlier all week, and I didn't want to stress/rush through bread-making, fire putting-outing, clean up, and get to commitment. New favorite thing: Make coffee, drink coffee. Make coffee again, pour coffee into Goat Story horn. Let coffee cool on ground while finish getting ready for the day. Put coffee in cooler. When I get back to camp in the afternoon - iced coffee, ready to drink! The bigger cooler was not as labor-saving as I'd hoped. I started off with a 10-lb block, and I needed more the next day - got a 7lb bag of cubes because it was easy to carry. The next day, I got 2 10-lb blocks, and those lasted that day and the next - but it took a few days to get the cooler full enough of melt water to have the thermal mass to fend off the heat. With as much as I was out of camp anyway, I probably could have just used the small cooler and gotten ice daily. Would have saved space in the car. Pitcher + bowl worked great, actually. I washed down with soap and water on Day 1, but ended up with a sticky soap residue all over on Day 2, even after 'rinsing' repeatedly with my 'rinse' washcloth. (I used one with soap to wash, and one with water to rinse.) After that, I washed my hands with soap, but the rest of me just got scrubbed with a wet washcloth. I felt clean (and the one day I skipped this - Wednesday night, before I left - I was itchy the next day, which I attribute to not having washed). My hair didn't look nearly as bad as I'd feared. I wet it down every day, too, and it ended up looking like I hadn't washed it for a day. Considering that I hadn't washed it for five days, that's not bad! And it was usually under a coif, veil or hat. My sister clued me in to the absorbing bags they sell for Luggable Loo. Somewhat more private than dragging the thing to the privy to empty it, but they do have a kinda weird smell. (The lid keeps the smell in, so it doesn't fill the tent, but it hits you when you use it.) You can also buy those blue deodorizing pellets to help with that, but... trying to buy less gear, here. I'm waffling on which approach I prefer. The 'kitchen sink' we bought a few years ago finally got used. It's two folding plastic cubes, one for hot water (wash) and one for cold (rinse). I'd put hot water and a few drops of dish soap into one, wash the dishes, put them in the other, and pour water from the pitcher on them individually to rinse. Given that it was just me and not an entire Scout troop, this seemed to make sense. True to the hype, my linen gowns could absolutely be reworn after an airing, even after pretty hot and sweaty days. I did a load of laundry part-way through, just socks and bras (which I was short on). I had enough underwear and bike shorts to get through without laundry. I had four linen gowns and wore them all, generally on their own. At night, I wore both my red Frankish gown and a wool cloak at different times. I wore my leather hood one cool night. Two days, I schlepped around in linen pants and cotton shirts. Even with bike shorts all the time, I still ended up with some heat rash. Not too bad though - I kept it powdered and it didn't hurt so much I couldn't walk. Toe scrape on an iron tent stake - kept it washed (with soap) and bandaged (Band Aid with antibiotic ointment already in the pad) and it didn't infect. CPAP battery got charged to full each day, even when it started to get cloudy. The solar panel and battery (in its nylon case) even got rained on one day, and they were fine. Cot + camp mat = perfect. Maybe I could do without the camp mat, but it's just awesome with it. Being higher makes the tent seem smaller (have to move in from the edge to cope with slanted wall) but then I get storage space underneath, which I totally used. Folding side table = adequate. Even with the elastics at the corners, the top surface doesn't stay flat. But it can hold jewelry, books, etc. Just not anything that has to stay level. Folding stool = useful. Sometimes seating, sometimes a stand for the CPAP. 0g chair = not used enough to justify. Last year, when my highest goal was to see how long I could do nothing, this chair was the bomb. This year, I didn't kick back and chill in it hardly at all. A regular folding camp chair would have been good enough, and would have packed way smaller. Table = somewhat small. I could generally to any two out of three: cook, food prep, clean up. Not sure the additional convenience of not having to juggle would be worth the additional gear. Also, the day shade probably would not have fit another table. Food trunk = too heavy. Picturesque, but oy. Tough to shift around. Accessories chest = just right. Clothes Rubbermaid = ugly but useful. Garb guaranteed dry (I Kondo'ed my gowns, rolling them and standing them up, and I could see my wardrobe at a glance) and I put the pitcher and bowl on top when I did my evening wash-up. Maybe I could paint it or, at a minimum, throw a cloth over it. So it's been pretty quiet around here! Two reasons for that: one, I was working on research for Sword, Stitch and Song (formerly Revenge of the Stitch, formerly Garb Wars). Two, after SwStSo, I went on a two-week business trip to Sweden and England. I'll be posting both of my Garb Wars-related documents soon, I think. And I got shiny, shiny loot in Sweden that I want to showcase when I have some pictures of it. But this post is about pilgrimage. I managed to make three non-business-related stops in Stockholm: to the Swedish History Museum (blurry pictures), to Aifur (I wore garb and yes, there are pictures), and to the island of Birka (also many pictures). I made a stop at the V&A in London, which I'd never visited before and was super cool, but it wasn't as personally significant as the Swedish History Museum or Birka. Part of the allure of pilgrimage - aside from Chaucer's cheeky assertion that it's just an excuse to travel - is making a personal connection with something transcendent. It's experiential, rather than knowledge-based. I know that there are spindle whorls and card-weaving tablets extant. I've seen pictures in books. I've seen charts of the patterns of the gold brocades found in the Birka graves. None of that is the same, for some reason, as standing in front of a particular spindle whorl and wondering who used it. What was she like? Was she kind or cruel, bitter or sweet, young or old? What did she make from the thread she spun, and who wore it? At Birka, my imagination wasn't caught by the grave mounds, rising under our feet, nor the distant valley where the 'Black Earth' held the remains of the trading center. It was the small, flat area where postholes indicate a longhouse stood. I walked over it - pacing it, 55' or 60' long, perhaps half as wide - and wondered. A garrison of elite warriors, possible returned Varangian Guards, had lived here, defending Birka. I've rented tents bigger than this, but it would have been palatial in its time. They lived, and fought, and possibly died - the last layer of remains show an intense fire and arrowheads shot into the wood - right here. Right where I'm walking. This is why some people go to Civil War battlefields, and other visit the graves of loved ones, and still others travel to Jerusalem or Canterbury. The sense of connection. Only bardic was telling Thrymskvitha for the children. I was so wiped, I went to bed immediately after feast, no bardic circle at all. What I thought was the "Works in Progress" display ended up being the "Works in Progress" competition. Oh! Glad I brought documentation, then. It was populace's choice, and my Overhogdal weaving actually came in second place. They gave me a lovely Viking wire-weaving necklace as a prize. It's really pretty.